The noradrenergic system is a key mediator of the stress response and is important in modulating anxiety, depression, and reward behaviors. In addition, it is now well known that dynorphin/Kappa opioids, galanin, and corticotropin release factor (CRF) neuropeptide circuits also modulate these behaviors via potential interactions with the NE system. 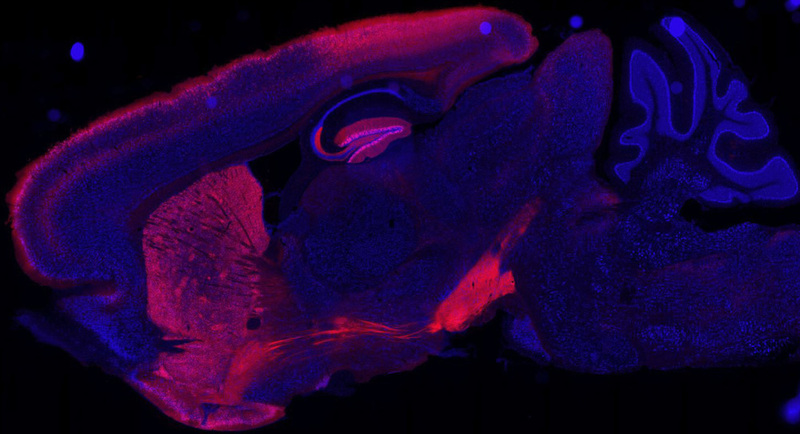 These projects use optogenetic, pharmacological, molecular/biochemical, in vivo calcium imaging, and genetic approaches to characterize and understand the relationship between neuropeptide circuits and monamine circuits in the regulation of stress-induced behaviors, such as anxiety, depression, chronic pain, and reward. The results from this work have begun to define a putative role of noradrenergic circuits in anxiety, aversion, and CRF dependent behavioral effects. Other components of this work include modulation of serotonergic neurons, glutamate and GABA projections, and ventral tegemental area dopamine systems. We are also investigating the specific components of the noradrenergic GPCR signaling pathways that are required for these various behavioral responses using novel optogenetic strategies in vivo. The primary goal of these project is to better understand the neurobiological mechanisms that underlie behavioral responses to stress, and how neuropeptide containing neurons interact with noradrenergic circuits to regulate motivated behaviors. We use biochemical, genetic, and viral approaches to identify new receptor ligands and biochemical approaches to identify GPCR signaling partners. One such major interest is the recently “deorphanized” opioid-receptor, Nociceptin/Opioid Receptor Like-1 (NOPR/ORL1). This receptor and its endogenous ligandnociceptin are believed to be involved in pain, stress behaviors, and parkinsonism. Like other opioid receptors, NOPR is coupled to inhibitory G-proteins, and can interact with the mitogen activated protein kinase (MAPK) cascade, including ERK1/2 and JNK. In collaborations with Research Triangle Institute and other group, we have developed and tested novel ligands at this receptor system. Furthermore, we have developed new Cre-mouse lines for optogenetic control of nociceptin-containing neurons, and knock-in mice expressing tagged NOPR. This project combines in vitro signal transduction with in vivo studies to integrate mechanisms of cellular biology with behavioral output. Parallel to this research in the laboratory includes the identification and characterization of less well studied GPCR systems that may be potentially important in affective disorders. We are actively pursuing the real time function of other GPCRs signaling outputs (mu-opioids, beta-adrenergic, CRF, CB1, etc.) in neural circuits involved in behavioral stress, anxiety and depression-like behaviors. Dynorphin/Kappa opioids and corticotropin-releasing factor have been shown to modulate stress-induced behaviors including drug seeking for cocaine and nicotine. This project aims to understand how stress influences reinstatement of drug (nicotine, cocaine) place preference and self administration. The laboratory is actively investigating how withdrawal and relapse to drug seeking is mediated by activation of stress neuropeptide and monoamine neural circuits and signaling pathways. At this time it is unknown which circuits, signaling pathways, and neuronal cell types mediate these effects. This project uses in vivo pharmacology, optogenetics, operant behavioral models, biochemistry, and mouse genetics. The central goal of this project is to understand the neurobiological and signaling pathways that mediate stress-induced changes in reward seeking behavior. Recently, an elegant technique was developed allowing for unprecedented control and specificity in mapping the molecular and cellular properties of neural circuits. This technique, termed “optogenetics,” takes advantage of light-sensitive ion channels, pumps, and G-protein coupled receptors to control neuronal activity and signaling with exceptional temporal precision. Some of the most burning questions in the neurobiology of pain, affect and addiction lend themselves particularly well to the implementation of optogenetic neural modulation techniques, yet these still require drastic miniaturization of circuits, power and light sources for full implementation in diverse neuroscience applications. This project aims to further develop biocompatible multimodal microscale inorganic light-emitting devices (μ-ILED) capable of permanent integration with the central and peripheral nervous systems for studying and treating neurological diseases. The lab is actively pursuing optogenetic tools for using light to control and modulate (stimulating/inhibiting) selected neuronal cell populations. In addition, the laboratory is developing alternative approaches to gain temporal and spacial control over discrete signaling cascades in vivo. These tools will aide in our dissection of the neural and molecular mechanisms of stress and behavior.